Did anyone see the appearance of the so-called colloidal silver "blue man" on Oprah? Some people I've spoken to thought it was a fairly benign show. In other words, they didn't think it had a very high potential for creating a negative impression of colloidal silver usage. In my opinion, Oprah did not have a very balanced show at all, particularly in terms of telling the truth about the safety of colloidal silver, and the extent of its infection-fighting and immune-boosting qualities. Oprah’s physician, Dr. Oz, kept referring to it as a primitive concoction, and kept asking the “blue man” why in the world he would take such a thing when there are modern, "safe," prescription antibiotics available. While he admittedly did not slam colloidal silver, he did leave viewers with the impression that you'd have to be a real dolt to use it. No effort whatsoever was made by Oprah or Dr. Oz to talk about the many healing and infection-fighting benefits of safe, sane, common-sense usage of colloidal silver. Oprah mostly spent her time delving into the man’s romantic relationship with his wife, and asking her how she met him, what she first thought when she saw that he was blue, etc. To me, the bottom line is that the media is using this poor guy as a modern day carnival sideshow freak, and television shows like Oprah’s will no doubt leave the mainstream American public with the mental image that colloidal silver users are kooks and freaks, and colloidal silver is an outdated and potentially dangerous substance that can turn you blue. For a FREE colloidal silver "safe dosage" report, which uses the EPA's own figures to help you determine your own safe maximum lifetime daily colloidal silver consumption based upon your weight, just go to www.TheSilverEdge.com and download it. I whole heartedly agree with you... it looks like the powers that be are taking a doing a large CS smear campaign. However the success of Colloidal Silver has come from the ground up and word of mouth. It is my opinion that this smear campaign will do nothing to change the momentum of Colloidal Silver , because word of mouth is far better than anything out there. The MSM is a tool used by the global elite. Just about everything put out by these guys is propoganda designed to brainwash us. Most of the sheep watching Oprah will now fear CS for the rest of their brainwashed lives. My BF called me wondering about this yesterday. was concerned I would turn blue. not like to be anything but blue now. day Antibiotics were unable to touch. wondered why colloidal was not used more. last word on an option which may work for you~! last word on an option which may work for you~!" lol... Zoebess, I really wish people would follow that advice. I think people are more interested in find out what is wrong with something than trying to actually understand something. Just look at the guys in the Moreless forum, they think that Colloidal Silver has something to do with actually taking silver to change the bodies chemistry. They didnt even bother to try and understand my post which explains everything and the process by which ICS works. They just proceeded to attack Colloidal Silver without even understanding it. Its also happening in the Candida Forum with Remi and others. I dont get it... I really dont. I mean i could understand if someone came up with some compelling information, or scientific evidence regarding why this might not be the best thing. But to attack something without even understanding it... or even trying to understand it. Its very pathetic. oprah got burned trying to expose the beef industry. she is not all powerful. CS could cost pharmedico billions in revenue every year. she didnt get all that fame and fortune by being stupid or playing the maverick. people are killed for dimes. we are talking billions. good point... I remember when that happened, there was alot of controversy and angry people. I think that the cattle industry took her to court too, which is pretty scary. So WHY DID THE MAN TURN BLUE?????? He used salt and baking soda. Didn't use a constant current generator. Drank 20 ounces a day for 3 years. All excellent ways of assuring a chance at blue skin. i think he likes the attention. the competition with selenium and his inability to sunburn are both interesting. i wonder what Iodine would do for the guy? It is no secret that the FDA has put colloidal silver at the top of their hit list - forget all the BS about turning people blue it simply represents a hughe threat to billions of dollars of profits to the world pharmaceutical empire that is the FDA's lord and master. What many people are still not aware of is that one company - CureZone sponsor Utopia Silver - was singled out by the FDA as the test case to see just how far they could go in restricting the sales of colloidal silver, and it was the FDA who sic'ed the state of Texas people on Utopia Silver. But they picked the wrong opponent and the wrong venue when they came after Ben Taylor and Utopia Silver. He has twice stood them down at his doorstep and has fought them to a standstill in court. It has now been almost 100 days since Ben Taylor in effect told them to get lost and that they had absolutely zero constitutional authority over him or his business. During the intervening time, there has been no word from the courts since their last failed efforts to trick Taylor into accepting jurisdiction. However, there has been a constant parade of Papa Smurff Karason on media large and small across the nation and a great many customers and would be customers have been scared by the propaganda. Coincidence? Some of us think not. Do not forget that Utopia Silver makes the best commercial product available and at one time was one of, if not the largest, maker of colloidal silver in the world. That is precisely why they were chosen as the test case. And when big pharma and their FDA and media lackeys put you on the hit list, you can expect no end to the harassment fair and foul that will be brought your way. Such is the way of the evil people who value profits over human health. Food for thought: hundreds of thousands of people use and have used colloidal silver. If the danger of turning blue is so great, where are all the blue tribes of people, hmmm? And where is there any single incidences of damage, much less death, cause by colloidal silver? Well as soon as I saw that guy, the first thing i though was 'i bet they're trying to turn people off Colloidal Silver '. People are only too ready to believe what they see on the tv, even people who you would think are intelligent. A few of my friends know I take Colloidal Silver and I had one of them laugh at me & my family for taking it when that man was on tv and saying i would turn out like that. I just said that i've been ingesting it for 10 years and never once looked even remotely like that, and that if he was that colour he must not have been drinking proper Colloidal Silver , as there is no way it could turn you purple/blue. I and my family have been drinking colloidal silver for nearly 15 years and none of us have turned that colour!! Perhaps some people up top were getting scared it might actually become well used and actually SAVE people in hospitals, rather than letting them die of golden staph infections. My bet is someone paid that man to pose as who he says he was - just like the US government paid (or organised?) someone to knock down the twin towers. For what? To istill fear in people. Fearful people are much more likely to cooperate with 'what's best for them'. 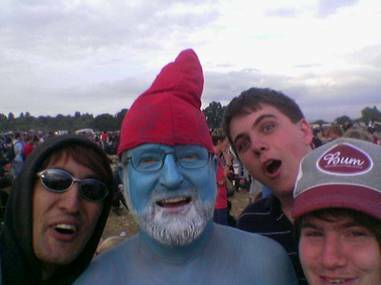 Anyway, i agree with you, the 'blue man' is total tosh. Free thinkers ahoy!